[From Ari Armtrong's blog:] As I recently noted, Republican U.S. Senate candidate Jane Norton has endorsed the "personhood" ballot measure to grant full legal rights to fertilized eggs. Every other leading Republican candidate for U.S. Senate and governor has done the same. So Colorado Republicans are over-the-top crazy for abortion bans, right? Perhaps. At the recent state convention, Republicans passed 59 resolutions ranging from a condemnation of "net neutrality" to a recommendation to vote against retention of four state Supreme Court justices. Most of the resolutions passed with near-unanimity. The only resolutions to garner double-digit opposition pertain to the line-item veto, Congressional term limits, and abortion and reproductive matters. 30. It is resolved by Colorado Republicans that life begins at conception and is deserving of legal protection from conception until natural death. 31. It is resolved that Colorado Republicans support overturning Roe v. Wade. 32. It is resolved by Colorado Republicans that pregnancy, abortion, and birth control are personal private matters not subject to government regulation or interference. It is interesting to note that, at the convention, where the most hard-core Republican activists gathered, one in five strongly rejected abortion-ban language. But what explains the clash between resolutions 30 and 32 (assuming the results were correctly reported)? 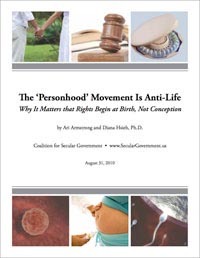 How can so many Republicans simultaneously advocate legal rights for fertilized eggs and declare "that pregnancy, abortion, and birth control are personal private matters not subject to government regulation or interference?" One possible explanation is that most of those voting rushed through the measures and had no idea what they were voting to support. But I'd like to think the participants took the exercise a little more seriously than that. Why might somebody intentionally vote "yes" on both 30 and 32? First notice the ambiguities of Resolution 30. The fact that, in some sense, "life begins at conception," says nothing about whether that life is a person with full legal rights. (Technically, life precedes conception, in that both the egg and the sperm are alive.) Moreover, the nature of the "legal protection" is not specified. I agree that a woman's embryo or fetus deserves legal protection as an extension of the rights of the woman; it is properly illegal to harm a fetus against the wishes of the woman carrying it. Do most Republicans really want to send women, their doctors, and their complicit spouses to prison for facilitating abortions? Do most Republicans really want to outlaw the birth control pill and the IUD because those things might cause the destruction of a fertilized egg? Do most Republicans really want to outlaw common fertility treatments that result in the destruction of fertilized eggs? Do most Republicans really want to empower police and prosecutors to go after women who miscarry under suspicious circumstances? Do most Republicans really want to put decisions about a woman's health in the hands of politicians, bureaucrats, and prosecutors? What, then, explains the fact that Republican candidates are falling all over themselves to endorse the "personhood" measure, Amendment 62? Apparently those candidates think their endorsements will gain religious right votes in the primaries without costing them much support among Republicans who dislike the measure. “Jane Norton has been a true friend of the family in Colorado and will continue to do so when elected to the Senate. We need Senators who will fight to defend the family against the radicalism of the Left in the U.S. Senate, and who won’t be a rubber stamp for the President’s extreme agenda. We are confident Ms. Norton will serve with distinction,” said Tony Perkins, chairman of FRC Action PAC. “Jane has been a leader in the fight to protect the unborn, and has worked to keep taxpayer dollars from funding abortion. As the executive director of the Public Health Department in Colorado, Jane was instrumental in de-funding Planned Parenthood in her state. She has been a true champion for faith, family and freedom,” added Perkins. “Her years of experience as a leader for pro-family causes in Colorado will serve Ms. Norton well in the Senate. FRC Action PAC believes that Jane Norton will be a true advocate for the issues that best uphold and strengthen families. We are proud to support her candidacy,” concluded Perkins. Earlier this year, Norton also won the endorsement of the Susan B. Anthony List, a conservative, pro-life organization. Norton has also sought, and received, the support of Sarah Palin, known for her anti-abortion sentiments. Yet Republicans who pander to the religious right or tolerate its horrific, police-state proposals are fools. Such Republicans wistfully hope that Amendment 62 doesn't really mean what its sponsors say it means, or that it will never really be enforced. They play a dangerous game.